It’s been a bit busy week or so with guests on short breaks and a mix between Carp and Barbel fishing. Lee, a very experienced angler on foreign waters who has banked several fish over 50lb with a current PB of 74lb, joined us for 4 nights. Conditions were very hard for him on his first taste the Orellana, gale force winds for the first 3 days made life difficult. 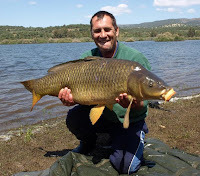 He battled on as the Orellana Carp got the better of him, out of the 7 or 8 runs he only managed to land 2 fish. Things got worse as Craig set up next to him for a day and banked a couple of fish to over 30lb, to make things worse Alan fished the following day and also had a couple of runs resulting in this fish just below 30lb. Here’s one of the fish he did land…… and what a smile to go with it!!!!!!!!!!!! Lee can’t wait to return to get his own back on these Orellana Carp; Craig is looking forward to fishing alongside him on his next visit. Barbel fishing was equally daunting for Dave on his 3 day visit, they didn’t get their heads down and he only had several takes, the best fish being this fish just scraping double figures. Alan landed a couple of Comizos and got cleaned off by a very good fish. Overall a great time was had by all; the big fella Mick kept us all laughing with his imaginative sense of humor. I’m sure it won’t take long for “the French Man Dave” and the “Romanian guide” to get their true identities back. Heres a couple of emails from recent guests, its things like this that makes all the hard work seem worthwhile. Thanks again for a great trip. Fishing was a bit hard but at least I only blanked one day out of 3 which is no worse than I’d do at home probably. That’s the way it goes. I still had a brilliant time and really appreciate all the hard work you were putting in for us. I’d recommend you to anybody. Mick and Alan were absolutely brilliant as well. Top guys and very funny. We’d better credit Mick too for my Comizos as he was the one spotting my rod go off on 2 of them when I was over talking to him. He’s as good as a bite alarm and much more entertaining and a good baiter-upper. Every angler should have one. During the course of the trip we had six upper 20's and four 30's, up to a PB 37lb scale perfect common. One fish, the one I lost, took 100 yards of line on a tight clutch and after an epic twenty minute battle the hook pulled. My guide Craig Reid, told me that it was a huge huge fish, one in a life time! Seeing that the record is over 79lbs my flight is booked for next year. Will also be returning next year as Craig is a top class guide and will bend over backwards to put the customer first. Thanks once again for the pictures and for teaching me so much new stuff, I appreciate it. We’ve have had a busy fortnight with a wide variation of guiding. We were employed by the Extremadura Tourist Board for a four day Press trip with guests from Holland and UK. Two days of heavy rain just before the guests arrived didn’t help matters; however in the tight schedule with only a few hours of fishing on each venue, we did ok. Bob and Robert stuck it out on the fly whilst the others fished the lure. Bob was well chuffed with landing a Barbel around 7lb on the dry fly, the other guests banked Barbel to over 6lb, Zander and Black Bass on lure tactics. 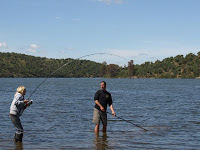 The lads were a great bunch; they all loved the area and the fishing it offers. 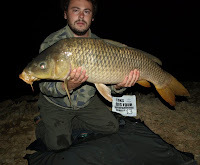 We are looking forward to seeing them again soon as they are already planning future trips..
Extrema Fishing have donated a couple of holidays in the UK area, so join up its free, you never know you could win a week’s fishing on the awesome Orellana. couple of 20’s from an overnight session on the Orellana, Craig will have to stop giving him tuition. Don’t forget this competition is free to join and there are some great prizes to be had. Disabled angler Andy just got back and didnt take long to get into fish. Within 16 hours of arriving he has had 4 fish, one he thought was a real lump as it peeled off all the line on his fox big pit reels before he could turn it. 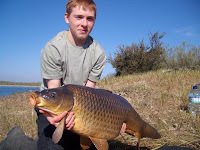 Andy, and a local Spanish angler who was watching, were shocked when eventually the fish popped up near the net, it was only a 24lb common. The 3 others landed weighed in at 24lb, 31lb and 31.5lb. Over the next 4 days Andy banked 11 fish between 18lb and 33lb. 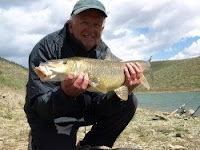 Keith Arthurs Barbel fishing trip on the Guadiana will be screened on Sky Tv Tight Lines on 24th April and 1st May. Extrema Fishing will soon be offering a Running River Package, fishing as Keith experienced, on waggler, stick and tip tactics. John and Mick enjoyed some exciting Barbel Fishing having up to 70 Barbel and carp a session. 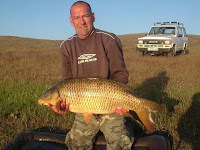 After a few weeks of Barbel fishing we finally got onto the Orellana for a bit of Carp fishing. The fishing proved difficult as the temperature plummeting 10 degrees and it rain almost everyday, the fish wouldn't get their heads down. Young Anthony's determination payed off and he landed this pb Common on his last day. Keith and Extrema Fishing Spain's Craig fished the river section on the Guadiana for Barbel this week. 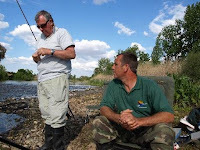 Check out how it went with Keith's on SKY's TIGHT LINES to be screened on 24th April and 1st May. We had a difficult time trying to entice the Orellana carp to feed late March, however we managed to get 4 runs in the week, an 18lb to Craigs rods, 3 to Andy's resulting in a 15, 22 and new PB of 33lb. A short trip to Sierra Brava early march saw irregular feeding patterns, especially over the bank holiday weekend. Anglers arrived in their droves, due to the noise the fish didnt feed until the Monday when Andy had 9 fish out upto the 19lb mark. Craig had 2 out of 3 runs in the 24 hours he fished, 18lb and a lovely 22lb Mirror. We will be moving onto the Orellana over the next few weeks, lets hope we catch the lumps in a feeding mood, time will tell.